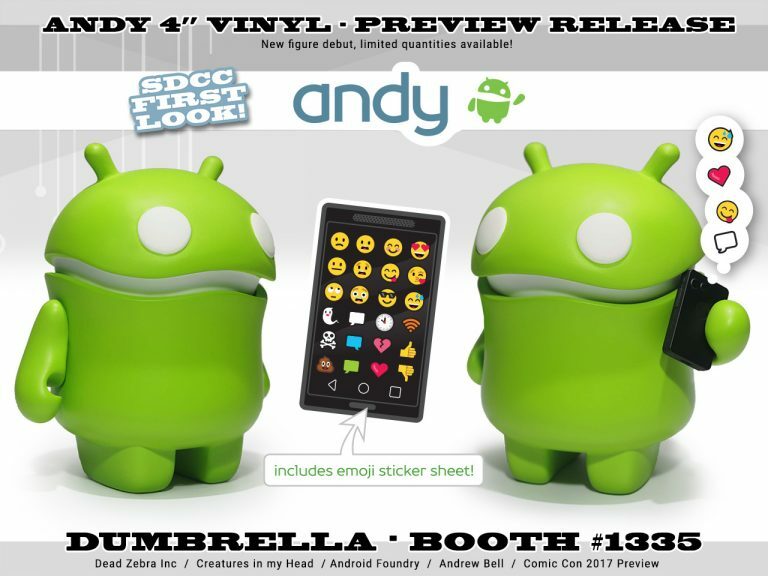 Meet Andy the Android, the newest addition to Andrew Bell’s super popular line of Android vinyl figures debuting exclusively next week at San Diego Comic-Con 2017! This 4” vinyl figure features cute lumpy lines with articulated head and arms. Each figure includes a tiny phone accessory and a sticker sheet of emojis to decorate the phone or Andy! Collectors can purchase this exciting new figure at the Dumbrella SDCC booth #1335 for $12. But act fast, as there will only be limited quantities available as part of this Comic-Con preview release.